The meadow Mari, 19th century. Canvas, hand embroidery, satin at the bottom of the back flap, silk embroidery on the edges decorated with hand-crafted buttons and sequins. The headdress, called the "shimaksh”, used to wear women of the Meadow and Eastern Mari; the latter migrated from the Volga region in the Urals in the 17-18 centuries, however they generally preserved features of their costume. 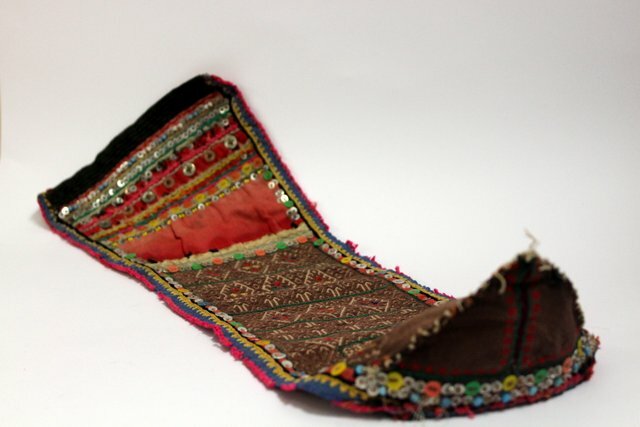 The shimaksh, was perhaps the most distinctive headdress of the Mari women. It consisted of an oblong piece of canvas whose corners on one of the narrow sides were bonded to form a triangle that formed the cap that was put on the head. The whole canvas field was embroidered with threads or silk and the lower end of the shimaksh, descending on the back, was sometimes trimmed with a fringe made ​​of wool. The shimaksh was secured on the head with a birch bark cap, which was put on a twisted bundle of hair. The meadow Mari worn the shimaksh on top of the head, while the eastern Mari would put it almost on the forehead. The shimaksh then would be covered with a canvas kerchief or a scarf ("pylyshmovich").